It was omnipresent at the ACC’s Operation Basketball media day in Charlotte last week. It has dominated college hoops headlines on all the major sports networks. It was the foremost topic for Commissioner John Swofford to touch on during his “State of the Union” speech. 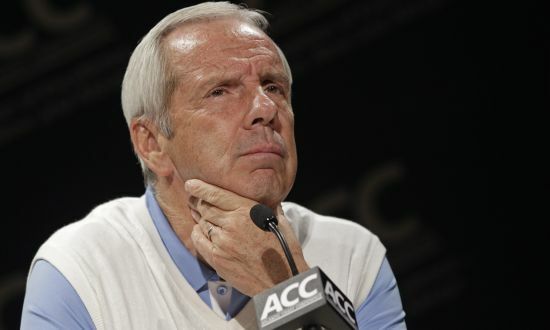 The ongoing NCAA investigations of North Carolina and Syracuse — both focused largely on the basketball programs — has thrown a long and foreboding shadow over what should be a thrilling season of hoops in the ACC. The NBA Draft is scheduled for Thursday, June 26, in Brooklyn. As we have done for the last several years, RTC will provide comprehensive breakdowns of 20 collegians likely to hear their names called by Adam Silver at some point in the draft’s first round. We’ll start with prospects currently slated for the back half of the opening round, but as June progresses we will slowly work our way up and through the presumptive lottery selections. RTC National Columnist Bennet Hayes is tackling this series; you can find him on Twitter @HoopsTraveler. Overview: I suppose there are some Syracuse fans capable of recalling the good times of the first three months of last season (in which the Orange ran out to a 21-0 start), but the lingering bitterness of a 3-6 close to the year is now difficult to avoid. Late February and March went as poorly as those months possibly could have for Jim Boeheim’s team, but the stench of that disastrous stretch appears to not have infiltrated the draft stock of Syracuse’s underclassmen, turned NBA hopefuls, Tyler Ennis and Jerami Grant. We’ll get to Ennis a little later on, but Grant’s breakout sophomore season appears to have planted him solidly in the middle of the draft’s first round. The stupendous athletic ability that he displayed during infrequent spells on the floor in his freshman season was put to much better use last year, as Grant made the most of a significant increase in minutes (more than double) to boost his per game averages in points (12.1 PPG from 3.9) and rebounds (6.8 RPG from 3.0) in 2013-14. His offensive efficiency rating also leaped from 103.2 to 115.6 (280th-best in the country), as Grant avoided the perimeter and focused on what he does best: offensive rebounding and attacking the rim from 12 feet and in. Grant made significant strides in many fundamental areas of the game last season, but even more exaggerated development will be needed if the Syracuse product is to become a quality NBA player. He lacks any sort of perimeter jump shot (although he did improve his free throw shooting, making 67% of his attempts at the line as a sophomore), struggles to put the ball on the deck and create his own shot, and hasn’t been asked to play much man-to-man defense. All are areas of concern, but as long as highlight reels exist, reminders of Grant’s tantalizing upside are never far from reach. As we continue to sift through the memories of the 2013-14 college basketball season, we take a look back at some of the best games of the season. In order, here are the five best games from 2013-14. We covered the five best stories of the season last week, if you’re interested. 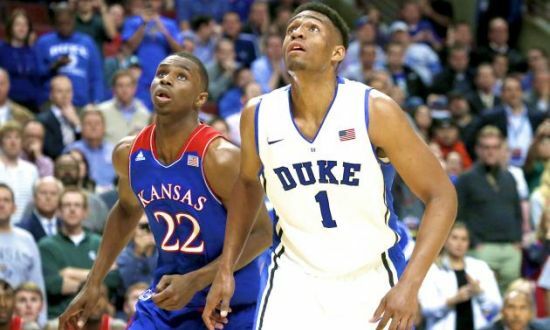 November 12: Kansas 94, Duke 83 — Two of the most anticipated freshmen in recent college hoops history matched up in the Champions Classic nightcap, and neither Wiggins (22 points, eight rebounds) nor Parker (27 points, nine rebounds ) disappointed. Kansas broke open a close game behind a late push from Wiggins and Perry Ellis (24 points, nine rebounds), in the process earning one of the season’s first true statement victories. The young Jayhawks would go on to win 25 games and the Big 12 regular season title, but their finest (and most entertaining) win may have come in their second outing of the year. Yesterday was a big day for NBA Draft announcements. The biggest name to announce that he was leaving college was Arizona freshman Aaron Gordon. Despite his game being ridiculously raw, this decision seemed like a no-brainer since he is projected to be a top-10 pick. Could Gordon’s game use a little (ok, a lot of) work? Sure, but it seems unreasonable to ask him to pass up a contract that will probably be worth at least $6 million. Two other players–Gary Harris and Jerami Grant–also decided to leave college and while they are not quite at Gordon’s level in terms of draft status they are both borderline lottery picks and in the top 20 of most mock drafts, which suggests that they should be almost guaranteed first round picks despite leaving after their sophomore seasons. A slightly more surprising departure was that of Glenn Robinson III, who projected to be a borderline first round pick (more likely a second rounder). There are conflicting reports regarding whether or not Robinson has signed with an agent yet, but it would seem wise for him not to do so since he is far from a guaranteed first round pick and his father should be able to get plenty of insight without the official use of an agent. Two other likely first round picks–Willie Cauley-Stein and Montrezl Harrell–opted to stay in school for at least one more year. The two sophomores were projected to be somewhere around the #20 pick in this year’s Draft so they passed up a pretty significant amount of money to come back and play. Both figure to be key pieces for their respective teams next year. Cauley-Stein could help Kentucky get back to the Final Four next year while Harrell makes Louisville (with more modest goals next year) a potential top-tier team in the ACC next season. We could be getting two more big draft decision announcements in the next few days and unlikely many cases we are not sure which way these players (sorry, student-athletes) will go. Nik Stauskas will announce his decision tomorrow. The decision for a Big Ten Player of the Year is a significant one for any program, but it is particularly so for Michigan with the recent departures of Jon Horford (transfer) and Glenn Robinson III (NBA Draft). Michigan won’t necessarily struggle next year if Stauskas leaves, but if he does you can forget about them contending for a Big Ten title. Jabari Parker is expected to announce his decision on Wednesday. Parker has already said that he will not be going on his LDS mission (at least not in the near-future), but is still deciding between returning to Duke for his sophomore year or entering the NBA Draft. If Parker does return (we honestly don’t see why unless he thinks he will learn to play defense as a sophomore), he would make Duke the prohibitive favorite going into next season even if they are a team loaded with freshmen. It was a busy day at St. John’s yesterday. Former St. John’s guard Max Hooper announced that he will be transferring to Oakland. This will be Hooper’s second transfer as he started his college career at Harvard and he will be eligible to play next year (with two years of eligibility remaining) as he is expected to graduate in May. Hooper is a three-point specialist and even though some are suggesting he could replace Travis Bader we don’t see that happening since Hooper only averaged 3.2 points per game. In more favorable news for St. John’s fans it appears that Chris Obekpa had a change of heart and is looking to return to St. John’s. This does not necessarily mean that Obekpa will be welcomed back by Steve Lavin, but it does place Lavin in an interesting predicament. Our guess is that he will give Obekpa some internal punishment that the other players in the program will know about just to show them that he is still committed to their program. John Calipari finally revealed what his famous “tweak” was that was credited in some circles as sparking Kentucky’s late-season run: telling Andrew Harrison to play like a point guard. According to Calipari, he showed Andrew tapes of Deron Williams and asked him what Andrew would have done in a similar situation. Invariably, Andrew answered “shoot” then Deron passed the ball for an assist. We never really bought into the whole “tweak” idea unless it was having Aaron Harrison hit ridiculous late-game three-pointers, but it served its purpose by deflecting attention away from the players even the actual idea was ridiculously simple. Half of the field is already gone, and as fun as Thursday and Friday were, it’s time to get down to the business of crowning a national champion. Here’s our analysis of all of Saturday’s games. 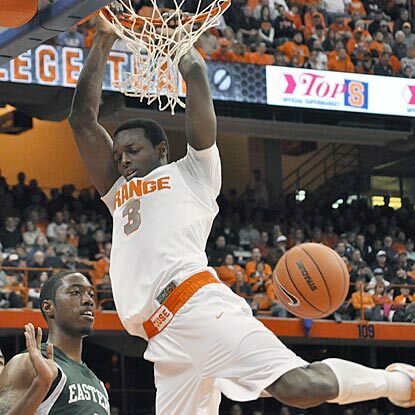 #1 Florida vs. #9 Pittsburgh — South Region Third Round (at Orlando, FL) — 12:15 PM ET on CBS. Lamar Patterson And Pittsburgh Had Little Trouble With Colorado In Their Tournament Debut, But A Far Stiffer Challenge Now Awaits: The Tournament’s #1 Overall Seed, Florida. Albany made things interesting for a while against Florida, but the South region’s top seed took control down the stretch to advance to the round of 32. The Gator’s third round opponent, Pittsburgh, made sure that their Tournament advancement was never in doubt, running out to a 13-0 lead on Colorado en route to a 77-48 rout of the Buffs. Impressive performance from the Panthers, but a second round blowout has never entitled anyone to a bye into the Sweet 16; Jamie Dixon’s team will have their work cut out for them on Saturday. Still though, this is a winnable game for Pitt. The Panthers are a #9 seed in the bracket, but Ken Pom’s rankings have them as the 15th best team in the country, and they actually share a lot of the same traits that have made Florida successful this season. Neither squad plays fast (Florida is 314th in adjusted tempo, Pitt 296th), but both teams are in the top-25 nationally in both offensive and defensive efficiency, and each collects caroms at a clip that puts them in the top-60 in the country in rebounding percentage on both ends. Neither team boasts an especially glaring weakness, although three-point shooting is not a big part of the game-plan for either side. Looking at the Pittsburgh stats page can be intoxicating; the Panthers really do look like a top-15 team on paper. An inability to close out games has been the largest roadblock for the on-court version of the Panthers to emit the same appearance, but there’s no reason why they can’t finally win one of those close ones on Saturday. 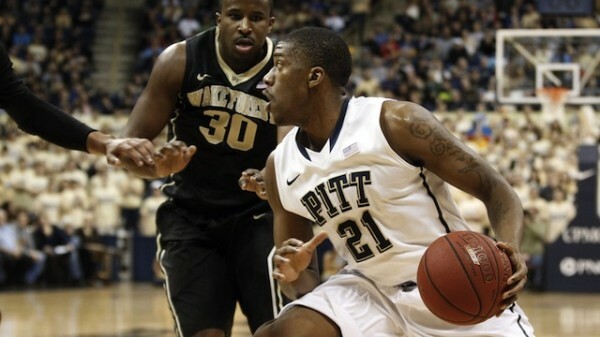 Pitt’s Lamar Patterson and Florida’s Scottie Wilbekin will not spend much time directly matching up today, but expect the bulk of the offense to flow through these two players. Patterson hasn’t been fully commended for what’s been a breakout senior season, but he’ll have his shot at some national recognition against the Gators. Outplaying Wilbekin would give Pittsburgh a great chance at moving on, but Wilbekin – and his gritty supporting cast – is where I’ll place my faith. I think Scottie does enough to keep Florida playing basketball next weekend, and in a game that may feel more like a Sweet 16 matchup than a third round game, Florida moves on. Syracuse looks sharp. The Orange have struggled mightily in recent weeks, but you wouldn’t have known it from watching them take on Western Michigan. This game was never close. Offensively, Syracuse’s ball movement was crisp, looks opened up under the basket, and the outside shooting was on point. Defensively, they stymied the Broncos for the much of the afternoon, eliminating passing lanes and hustling on every rotation. It was the type of energetic, complete effort that projects well for the Orange going forward. Trevor Cooney might be key going forward. While Jerami Grant, C.J. Fair and Tyler Ennis were all excellent today, Trevor Cooney – and his 18 points on 4-of-8 three-point shooting – might have been the guy who really broke Western Michigan. Cooney buried several triples during the first half and early in the second half that squashed any small amount of hope the Broncos held on to. His ability to get hot and go on one-man runs might be crucial in elevating Syracuse from mere South Region threat to legitimate National Championship contender in the coming weeks. Crowd will be a factor on Saturday. Make no mistake about it – as good as the Dayton crowd was today, it did not hold a candle to the Syracuse contingency. And that’s not a knock on Flyers fans, either, because they were excellent. But the close proximity of the Orange faithful was evident from the get-go, and no single roar in the first game matched the ‘Cuse roars in the second. If Archie Miller’s crew plans on advancing to the Sweet Sixteen this weekend, it will have to do so in a hostile environment. And so it begins. Today at exactly 12:15 PM in Buffalo, New York, the 2014 NCAA Tournament as we all know it will officially tip off, setting in motion a chain of events that will undoubtedly bust most people’s brackets by mid-afternoon. Nevertheless, the anticipation for the best two weekdays in all of sports is over. Savor it. Embrace it. Respect it. Let’s get things started with an analysis of all of today’s games, beginning with the afternoon slate of eight contests. 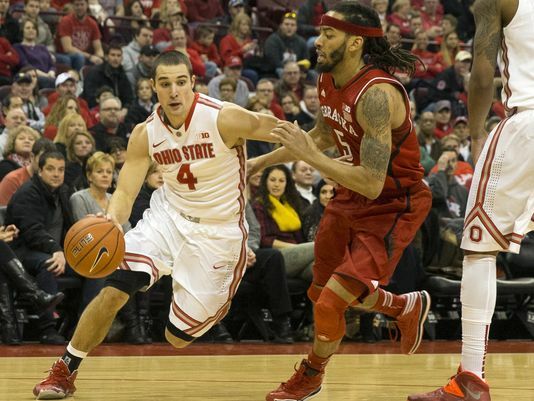 #6 Ohio State vs. #11 Dayton — South Region Second Round (at Buffalo, NY) — 12:15 PM ET on CBS. You could ignore the fact that Dayton and Ohio State are separated by 70 miles of Ohio interstate, that the Flyer’s leading scorer is an Ohio State transfer, that Thad Matta has never had any interest in scheduling a regular season game with UD, and this game would still be one of the most intriguing matchups of the first round. Or you could, of course, take account of all those things and declare this the game to watch in the round of 64. Former Buckeye Jordan Sibert will be a marked man on Thursday afternoon, and not just because he used to don the scarlet and gray. Sibert (43% 3PT) leads a proficient Flyer offense that excels beyond the arc; Dayton has made 38% of their three-point attempts this season. Aaron Craft receives plenty of recognition for his defensive abilities on the perimeter, but Shannon Scott is nearly Craft’s equal when it comes to on-ball defense, and both will strive to make Sibert and the rest of the Flyers’ life difficult. Similar resistance is unlikely to be provided by a Dayton defense that is less than elite, but can the Buckeyes take advantage? Ohio State’s scoring struggles this season have been well documented, but look for LaQuinton Ross and Lenzelle Smith to get just enough done offensively for the Buckeyes to seize this battle for Ohio. Either way though, subplots abound. ACC Microsite writers Matt Patton and Brad Jenkins will be reporting live from Greensboro at the 2014 ACC Tournament throughout the week. Three Key Takeaways in the Wolfpack’s upset win. N.C. State’s Star T.J. Warren Celebrates Upset Over Syracuse. N.C. State finally got that elusive quality win its been hunting all season. After last second losses to Syracuse and North Carolina in the ACC regular season, the third time was the charm for the Wolfpack. While the win may not put N.C. State into the NCAA field just yet, at least it keeps that dream alive. And with many other bubble teams falling all over the country, the Pack may be in great shape for a bid if they can at least get to the championship game. This game was following the same script as those previous two heartbreaking losses, with the Wolfpack building a nice second half lead only to see the opponent come back and take the game down to the wire. 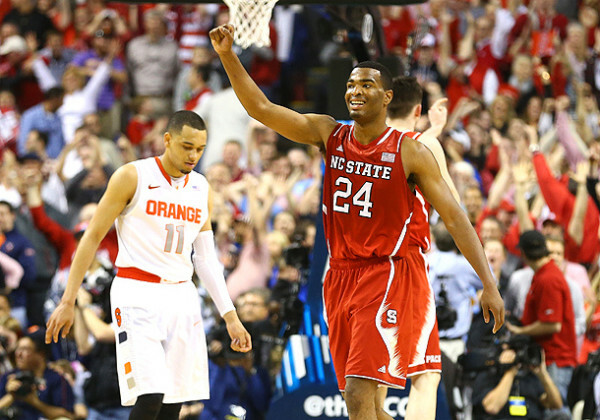 But this time, N.C. State rewrote the disappointing ending. It was instead the Wolfpack that made more winning plays down the stretch. Two of the biggest were on the defensive end, as N.C. State drew offensive fouls on C.J. 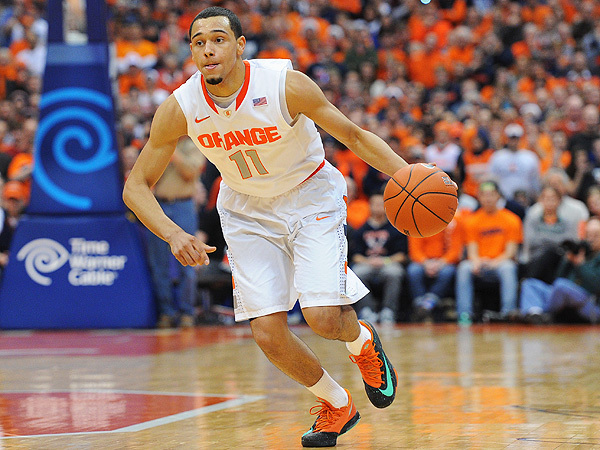 Fair and Tyler Ennis in the last three minutes of play. Saturday’s game between Virginia and Syracuse will crown this season’s ACC champion, but it’s also a showcase of two teams coming in with very different levels of confidence. While Virginia is riding a hot 12-game winning streak, Syracuse is entering the contest having lost two of its last three games. Both of these teams play notoriously slow, but the likelihood of this one becoming a runaway in either team’s favor is also highly unlikely. While Syracuse is quite literally one of the slowest teams in the nation, Virginia is only one spot ahead of the Orange, ranking 344th in adjusted tempo out of 351 total teams. Over the last few weeks, Syracuse has eked by in numerous close victories with controversial finishes before managing to drop its first two games of the season in both embarrassing (Boston College) and enraging (Duke) fashion. Tyler Ennis’ seeming invincibility has worn off somewhat as he has cooled off offensively, showing a human side to his unshakably calm demeanor. Part of Syracuse’s weakened state can be attributed to one of head coach Jim Boeheim’s major criticisms: an unbalanced and back-loaded schedule that has Syracuse finishing its inaugural ACC season with four of its last five games on the road. Syracuse’s play of late even has some ESPN analysts like John Gasaway indirectly stating that it may be the first #1 seed to ever fall to a #16, showing just how far the national perception of the Orange has fallen over the recent bumpy stretch. On the flip side of the coin, Tony Bennett’s Virginia squad is riding an epic wave of momentum that is well on its way to carrying his team to its first sole claim on the ACC regular season title in over three decades. Virginia has won a school record 17 straight games at home and is sitting in sole possession of first place in the ACC at 15-1. Since a brutal 35-point road loss to Tennessee before the new year, Virginia appears the part of a conference champion, winning numerous low-scoring affairs with stifling defense (no ACC opponent has score more than 70 points). Unlike Syracuse’s schedule, the Cavaliers have the boon of three of their last four ACC contests occurring at home in John Paul Jones Arena. While Virginia may not have a single elite scoring option like the Orange’s C.J. Fair, leading scorer Malcolm Brogdon is more than capable of taking over a game and the Cavaliers boast three players who average between 7.9 and 11.5 PPG. So while Syracuse comes into Charlottesville with their pride wounded after a scorching start, Virginia’s confidence has never been higher in its attempt to prevent a newcomer from claiming the conference title in its first season. ACC Microwriters Chris Kehoe and Lathan Wells will focus in on the key questions surrounding this marquee ACC match-up, tipping off at 4:00 PM ET on Saturday (ESPN). Each week throughout the season, RTC columnist Brian Otskey (@botskey) will run down his observations from the previous week of college basketball. There is a vocal group out there making it known that Wichita State should not receive a top seed in next month’s NCAA Tournament. They argue that the 30-0 Shockers “haven’t played anyone” and that alone should disqualify Gregg Marshall’s team from landing on the No. 1 seed line when the brackets are released two and a half weeks from now. We can debate the merits of the RPI all we want, but the fact is it remains one of many important selection criteria. Wichita State’s non-conference schedule ranks No. 34 in that metric, which is actually pretty good. By comparison, it is only four spots lower than Georgetown, a middling Big East team about whose schedule people have been raving. Perception is indeed a funny thing. Ron Baker should be angry if his Shockers don’t get a No. 1 seed. (photo courtesy rantsports.com). Wichita State cannot control the strength of its own league, which also happened to lose Creighton to conference realignment this season. There is something to be said, however, for taking every team’s best shot each and every night and still winning with relative ease. The Shockers beat the second best team in the Missouri Valley, Indiana State, in convincing fashion in Wichita and won the return meeting in Terre Haute comfortably. Out of conference, the Shockers challenged themselves with games at Saint Louis, Tulsa and Alabama, along with a visit by Tennessee to Wichita (Note: Game was played off campus and not at the Roundhouse). Wichita State also played BYU in a two-day event at the CBE Hall of Fame Classic in Kansas City. The Shockers have certainly not faced a murderer’s row type of schedule, but at 30-0 with a top 35 non-conference slate, that is good enough to be rewarded with a No. 1 seed. In the next two weeks you will hear a lot of pundits talk about tournament resumes, good wins and bad losses. Just remember, Wichita State doesn’t have any bad losses. It has NO losses, period. Dear Selection Committee: Do the right thing and give this team a No. 1 seed! Say the word “Syracuse” this week and most people will immediately think of Jim Boeheim’s classic meltdown at Cameron Indoor Stadium where the iconic Orange coach was ejected from a regular season or postseason game for the first time in 38 years as a head coach. While that was certainly a memorable moment, it masks the nosedive that Syracuse’s offense has taken over its last four games. Over the Orange’s first 24 contests, they recorded an offensive efficiency below 102.1 points per 100 possessions just twice (in wins over Miami and North Carolina). Over the last four games, Syracuse’s offensive efficiency has been 92.5, 94.3, 99.6 and 88.6. Ironically the 99.6 number was in the loss to Duke, but the Blue Devils are the best offensive team Syracuse has faced all season.